Whether you’re landscaping a yard or creating brand new flower beds, one essential of your plan to decide in advance is what type of plant watering system you’ll use – drip, soaker or sprinkler systems. Many new do it yourself landscaping or gardening are so excited with new plants and garden supplies, they simply start digging holes and putting everything into the ground. Little thought goes in about how well the location and preparation will work for them in future months or years. When this happens, watering can become a real chore if irrigation hasn’t been prepared for in advance. For instance some flower bed locations may not be easily accessible with a garden hose. 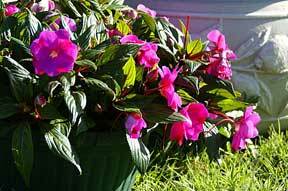 In this case, you’ll need to find alternative methods like drip or soaker hoses to water plants and flowers in the bed if enough natural rainfall does not take care of the plant watering job. The same applies to landscaping also: Some parts of your landscape and yard might not have easy access to even a standard water hose. The grass in those areas could shrivel up and die if you don’t water on the area regularly. These are usually the most inexpensive way to make sure water reaches as much of your yard and landscaped areas as possible. Sprinklers cost less than drip systems with a cost of around ten dollars at most discount department stores. Simply screw your water hose into the end of the sprinkler, set the sprinkler for the coverage you want, and place it in the proper location of your landscape. You can go more elaborate and expensive by installing underground sprinkler systems. Sprinklers water your grass and flowers from the top down, and can be left on for as long as you’d like to make sure your plants get a good solid soaking. In certain parts of the United States, you’ll need to run your sprinklers in the early morning though, to be sure the water has plenty of time to dry and evaporate before nightfall. This will help prevent rot and mildew on your lawn or flowers. If however, you live in a very hot area of the country, you risk burning your grass and flowers by watering them during the day. Very early morning usually works fine most of the year, but during the hottest seasons it’s usually safest to water in the evening instead.